In this free worksheet, students must use the coordinate plane to answer questions such as "In which quadrant does the point lie? ", "Find the value of k if (k, 7) lies on the line y = 4x + 7", "State the y-intercept of each line", and "find the equation of a line that passes through the point"
1) In which quadrant of the number plane does each point lie? 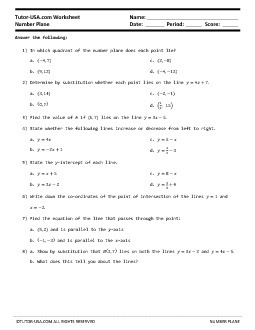 2) Determine by substitution whether each point lies on the line y = 4x + 7. 3) Find the value of k if (k,7) lies on the line y = 3x - 5. 4) State whether the following lines increase or decrease from left to right. 5) State the y-intercept of each line.